It’s ironic that a storm -- one that caused widespread blackouts that left millions of Americans in the dark -- is finally helping us see the light. Hurricane Sandy brought devastation and loss to the Eastern Seaboard. The storm exposed the severe vulnerability of our electricity infrastructure and made global headlines as a harbinger of nature’s impacts in a climate-changed world. But beyond the shock, New Yorkers found a silver lining in the destruction. The storm made it crystal clear that the existing electricity system is not suited to address the challenges of the 21st century. In response, New York state recently released a powerful report illuminating how it plans to create a more affordable, efficient and reliable grid. 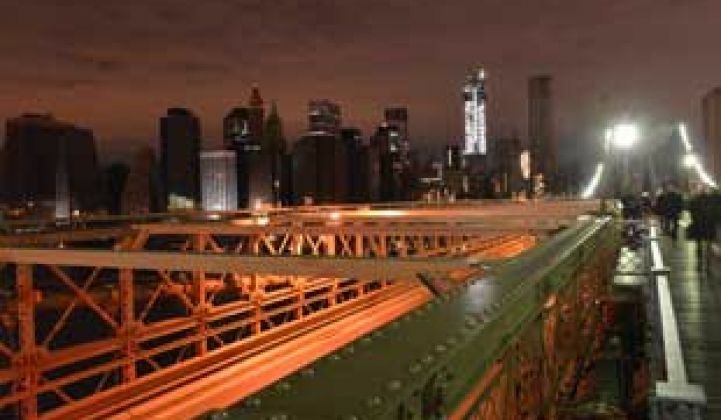 Titled Reforming the Energy Vision, this game-changing document calls for a new approach to generating, managing and delivering electricity throughout New York. The state proposes to replace aging infrastructure by investing nearly $30 billion over the next decade to develop a smarter electricity system. State officials, seeing the performance and cost benefits, are moving quickly to put this vision into action. Central to the new strategy is replacing two obsolete notions: that the model of centralized generation combined with long-distance transmission is the most cost-effective option, and that utility customers should only consume -- not produce -- grid services. When it comes to the electricity system, Sandy helped to make it clear that bigger isn’t always better. To expand grid services, we have historically incentivized utilities to build large power plants and big transmission infrastructure. This has led to an inefficient and overly expensive electricity system. States across the country have built significantly bigger systems than necessary. For example, New York’s electricity system uses just 60 percent of the electricity it is capable of generating, on average, because many power plants operate only a small number of hours each year when demand for electricity is highest. Additionally, roughly 10 percent of transmission-dependent power is lost because of inefficiencies associated with power traveling long distances. As a result, most New Yorkers pay more for energy than they should. For a deeper look at how Sandy changed utility planning, read Greentech Media's recent e-book, Resiliency: How Superstorm Sandy Change America's Grid. Now, smart information systems, energy efficiency, and local renewables are challenging the centralized power paradigm in terms of performance and costs. These distributed energy resources can provide resilient, affordable electricity services driven by private investment and innovation. The Hunters Point Community Microgrid Project in San Francisco, being conducted by the Clean Coalition in collaboration with Pacific Gas & Electric, is proving the technical and economic viability of this distributed grid architecture. To unleash distributed energy resources in New York, officials are redefining the relationship between utilities, their customers, and the power grid. Rather than simply providing energy as a commodity, New York now sees its utilities as businesses that can be incentivized to provide electricity as a service. Moving forward, utilities will manage the grid as a platform where innovative businesses compete to provide grid services. The result can be drastically improved performance of the electricity system and reduced costs for everyone. New York is on the right track and leading the nation toward a clean, efficient and reliable electricity system. But even more should be done. Smart, two-way meters in every home allow effective demand management, while competitive rates of payment to all licensed grid service providers can drive competition and innovation, which benefits consumers. Greater support for distributed generation will power economic growth, producing more jobs per dollar invested than traditional power plants. And deployment of local renewables can be accomplished at remarkable speed, enabling a transition to a zero-carbon electricity system in as little as two decades, according to our studies. The U.S. electricity system is outdated -- and so are the policies that continue to guide its development. Although it’s not easy to change century-old paradigms and infrastructure, New York is embracing this challenge head-on. Hurricane Sandy was a devastating storm, but it is spurring a shift toward cleaner, cheaper and more reliable power. Hopefully, these winds of change reach well beyond New York’s borders. Daniel M. Kammen is a Distinguished Professor of Energy at the University of California, Berkeley where he directs the Renewable and Appropriate Energy Laboratory. He has served as Chief Technical Specialist for Renewable Energy and Energy Efficiency at the World Bank. Craig Lewis is Executive Director of the Clean Coalition, a nonprofit leading the transition toward renewable energy and a modern grid.